Welcome to back to our newest (and funnest) method of reviewing/recapping season three of How to Get Away with Murder. Usually, film section editor and film writer Allyson Johnson is joined by film writer AJ Caulfield in discussing (mainly reacting to) the latest episodes live. This week comes a standard review. To read our coverage of the winter finale, click here. OK, OK — you likely know the drill by now. Ally and I sit down together (though this week, scheduling/timing/general adulting and the horrendous traffic I endure when the snowbirds flock to Florida and are yet to leave had us watching separately, probably for good reason, but I’ll get into that later) to watch and rant about everyone’s favorite over-the-top drama How to Get Away with Murder. Before the show took its ubiquitous winter break, Ally and I nearly fainted at our screens when the infamous “body under the sheet,” the one we’d been speculating about all season, was finally revealed. A slew of questions flooded our brains: Who actually killed him? Why did they kill him? Why did the showrunners/writers/whomever else works on this Shonda Rhimes-ian rollercoaster of a show kill him?! Thankfully, this wine-fueled, anxious interrogation was relatively short-lived, and we had the whole holiday season to distract us from losing the character who, arguably, made the show what it was. When I tucked into the corner of my couch, flicked on the DVR’d episode (I forgot how much I love skipping through the commercials), and reached for my mug of tea (listen, I’m sick and needed something physically calming to stay ahead of whatever crazy the comeback episode was going to throw at me), I faked that I was ready. But most of all, I just wanted the answers and to pretend that Wes, the puppy, was still alive. Of course, I only got about a quarter of what I’d hoped for. Wes is as dead as ever, and only a cherry-picked few of my questions were addressed and put to rest. With Bonnie now holding the reins, which is kind of a terrifying premise but I’m choosing to ignore it in favor of thinking things might turn out alright in the end, there’s no telling who knows what — or even what they really know. Annalise claims she knows nothing of Wes’s murder, and the Keating 4 (wow, that’s tough to type) echo her. 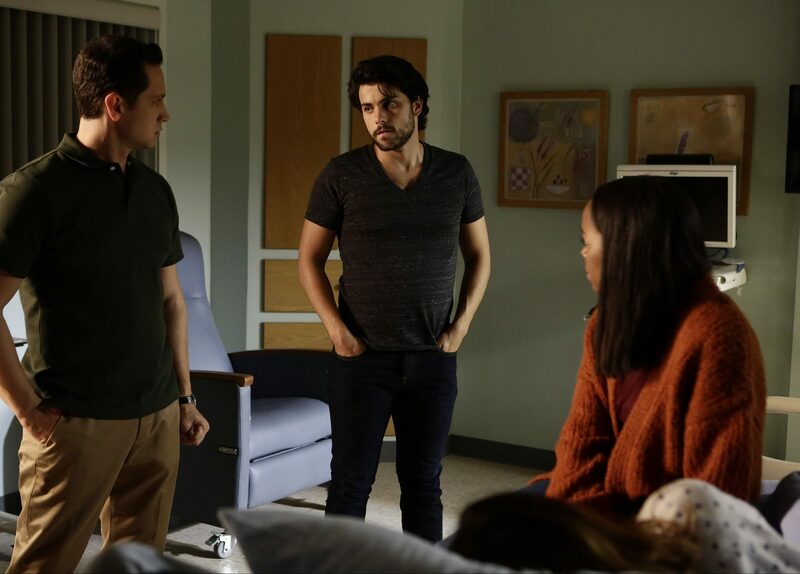 It’s not anything HTGAWM fans were hoping for, but it’s what we’ve come to expect following a shocking reveal: a slow-burning, high-tension episode that skirts around Q-and-A in favor of unraveling the motivations and circumstances behind the event where things boiled over. It’s classic How to Get Away with Murder; we saw it in season 1 after we saw Frank strangling Lila and hoisting her body into the water tank (this seems like forever ago and much simpler times for the show and its characters) and again in season 2 following Rebecca’s murder by strangulation/suffocation. It’s not great, but it’s typical. What this episode does do well is something, again, we’re used to: flashback sequences. How to Get Away with Murder has found a pattern of storytelling that works and has become unique to the show. Time and events are chopped up into bits and arranged in a way that heightens the dramatics and leaves viewers yearning for more — usually separated into two timelines of “x amount of months before the Big Thing” and tiny portions of real-time scenes when the Big Thing is actually happening. Once the timelines meet up, the show explodes, doling out punch after agonizing punch of twists and turns. Then, upon returning, the hidden moments (generally the most crucial ones, for good reason) are unveiled in flashbacks. My favorite one of this episode? A grief-stricken Laurel reminiscing on the intimate moments she shared with Wes, whom she claims she loved more, and more intensely, than she ever loved Frank. Speaking of the actual worst character on this show, let’s talk about Frank for a second. Frank confesses to Wes’s murder. Straight-up takes the fall for it, even though the defense attorney states that Wes died by fire, not by homicide. (Yeah, likely story.) Combine Frank’s building guilt over the car crash that changed Annalise’s life forever, his falling out with not only Laurel post-breakup but also with both Bonnie and Annalise when his dirty past (and present) is revealed, and the voicemails Bonnie left on his phone with Laurel’s confession re: Wes vs. Frank, and it’s little wonder Frank buckled and confessed. Whether he actually killed Wes or not, only time will tell, but I wouldn’t bet against it. Even though Ally and I have made a generous number of speculations throughout season 3 as to what the hell is actually going on and ended up being super wrong, I’ll hedge a bet I think might be more accurate than Frank being the killer: Annalise killed Wes. It sounds crazy and logistically might not be possible, but the show is crazy. And I’ve learned that nothing is impossible. Given their history and the mounting tension among everyone, Annalise might have snapped. That brings me to my next point: how everyone is faring post-reveal. They all seem to be themselves, only to the nth degree. Connor is as self-sabotaging as ever. Laurel is more intensely swayed by her emotions (rightfully so) than ever before. Annalise is in jail, Asher somehow outdoes himself in the douchebag department, Oliver is sneaking around like he knows something no one thinks he knows, Frank is having a breakdown, and Nate… where is Nate? Guess that’s just another question to add to the expanding list. While the midseason premiere wasn’t anything special, it’s nothing I can turn my nose up at; I like having How to Get Away with Murder to look forward to on Thursday nights, and can’t wait to uncover more as the rest of the season unfolds. Here’s to hoping episode 11 addresses and ticks off the majority of our collective concerns on the list. Previous ArticleTV Review: Emerald City 1x05 "Everybody Lies"